OPTIMIZED FOR YOUR PORTABLE DEVICE. This ebook is compatible with devices that can read *.mobi file formats. This new second edition includes new creatures, new magic, and new optional OSRIC rules not appearing in any other Usherwood Publishing product. Click here to get the .epub instead. Click here to get the .pdf instead. Dragon Hordling; a tortured half-breed mixture of human and dragon. Use the creature's ability of limited flight and minor breath weapon to your advantage. Half-orcs; two new sub-races of orcish original. The more intelligent goblinesque is allowed to become a magic-user of minor power, and the brutish orgre is a berserking behemoth. Sarngoch; a mysterious race, taller than humans, and more charismatic than elfs. These demi-humans of noble appearance have an innate ability to cast limited arcane spells. But the magic within them is both a blessing and a curse! The Jack-of-All-Trades; build a character whose skills are as unique as his carefully-crafted personality. Includes skills from the archetypical classes; assassin, cleric, druid, fighter, illusionist, magic-user, paladin, ranger, thief. Even include talents from new Usherwood class; the Vermean Monk. The Vermean Monk; a new take on the classic First Edition monk is a martial arts master, without the supernatural abilities that can unbalance your campaign. Challenge your players with 28 new monsters, including six new species of dragon. Reward your players with 10 new magical armor, weapons, and miscellaneous magic items. Open adventuring possibilities with Usherwood's take on psionics; re-written from the First Edition appendix. These rules governing psionics are more spell-like in the way they are handled, and more easily incorporated into your campaign. This section also includes 14 psionically-sensitive monsters to challenge the would-be mentalists in your group. 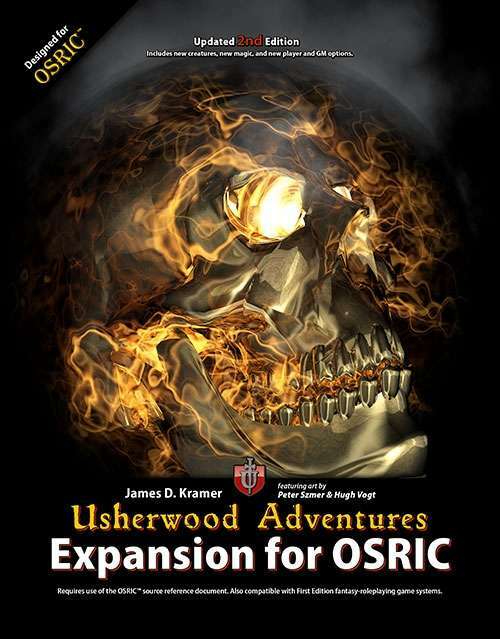 Inspired by the Usherwood Adventures campaign setting, the material contained in the Usherwood Adventures Expansion for OSRIC is completely setting-agnostic, and easily adaptable to your campaign world. 202 pages of new material, much of it never published previously, and only to be made available in this publication. As all Usherwood Publishing PDF products, this book is fully forms-activated for Adobe ReaderTM (or other PDF-capable application) so you can include your own notes live, on each and every page. Dieses Produkt wurde am December 19, 2012 in unseren Katalog aufgenommen.